Jupiter’s moon Europa is on the shortlist of places we might discover alien life in our solar system. And today, the prospects for finding extraterrestrial microbes on this little ice moon got a lot better, when NASA unveiled new evidence for water geysers near Europa’s south pole. The discovery strengthens the case for a geothermally-heated, subsurface ocean. The discovery, which will be published this week in the Astrophysical Journal, came about after a 15 month-long Hubble Space Telescope observational campaign, which saw Europa transit in front of Jupiter in the far ultraviolet on ten separate occasions. 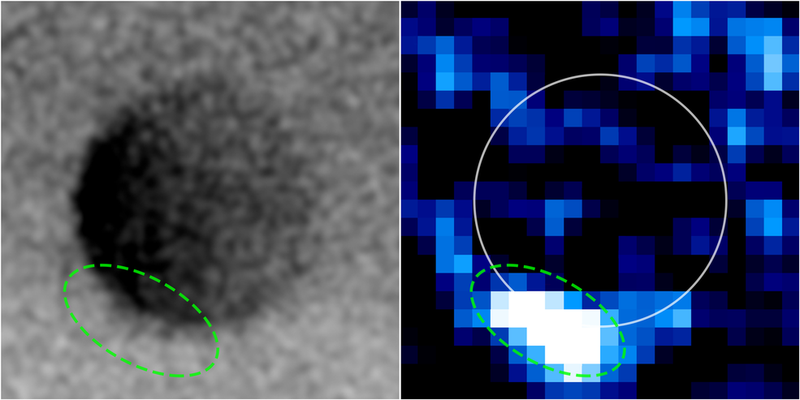 During three of those transit events, Hubble observed spectral features that could be plumes, mostly emanating from Europa’s south polar terrain. Today’s announcement marks the second time that astronomers have discovered signs of geyser activity on Europa. The first evidence came in late 2012, when a separate UV imaging analysis by Hubble revealed elevated levels of hydrogen and oxygen near the moon’s south pole. That data was taken to indicate two enormous plumes of water, jettisoning skyward to a height of 125 miles (200 km). But the finding was never replicated—not by Hubble, nor in data captured by several Jupiter-bound spacecrafts—until now. This prompted speculation that Europa’s geologic activity is quite intermittent, perhaps only occurring during specific parts of its orbit around Jupiter, when the gas giant exerts a powerful tidal strain on the moon. Hubble’s latest exciting clues—UV absorption features that could indicate water—seem to support this picture. “If the features are real, they have to be intermittent, because we did not see anything on seven occasions,” Sparks said. Europa isn’t only the eruptive moon that might be sheltering warm, life-friendly waters beneath its frozen exterior. A little further down the cosmic street lies Enceladus, whose south pole plumes spew seawater full throttle all the time, offering free samples to any spacecraft that happen to be in the neighborhood. Cassini’s discovery of activity on Enceladus has prompted some astronomers to propose a dedicated astrobiology mission to the moon, which could sample that seawater for signs of life. Artist’s concept for “chaos terrain” on Europa, with liquid water from a subsurface ocean seeping through cracks in the overlying ice. Image: Schmidt et al. 2011. An Enceladus life finder mission has not yet been greenlit by NASA—but a mission to Europa is already in the works for the 2020s. Not only are the latest signs of activity sure to generate excitement for that mission, they could help us design it for the best possible results.